What does Climate Change, Child Labour and Species Extinction have in Common? Palm oil is an ingredient in thousands of everyday products found on the supermarket shelves. Globally, it is one of the biggest sellers. Shampoo, cosmetics, fast food, fuel and many of the products in our home have had some form of processing related to palm oil. Unfortunately, the very nature of palm oil production often equates to the destruction of tropical forests and peatlands, leaving devastating effects for the wildlife, local economies, and for our planet. The palm oil industry’s reputation isn’t an unknown, but the consequences of leaving this industry unchecked may very well be. One group of particular scientists have banded together to form the Union of Concerned Scientists (UCS). Their statistics and research is alarming. 50 million metric tons of palm oil was produced per year in 2012, having doubled since 2000. It continues to grow, with more than a third of all vegetable oil worldwide coming from palm oil. It’s no surprise to see an increase in the production of palm oil. It’s healthier, low in trans fats, and the potential for biodiesel fuel is expanding. The growth of the plant is high yielding by around 5 to 8 times more per hectare, according to the UCS, than other oil-crop competitors. The labour costs are generally low and it’s an inexpensive oil. All arguments for the production to continue. However, the low costs in production can generally be attributed to forced labour or child labour. The high yielding hectares are quickly wiping out rainforest and eco systems essential to local farmers and endangered species, like the Sumatran orangutan, pygmy elephant and tiger. Worldwide, it’s a total of 40.6 million acres (16.4 million hectares). Of this figure, 85 percent is grown in Indonesia and Malaysia. The “carbon-rich” rainforests and peatlands that are being wiped out for palm oil are “found nowhere else on Earth,” states the UCS. Not only is this at risk, but climate warming is now being linked to the destruction and clearing of these lands. Sustainable palm oil is a reality, but efforts made to create a balance have so far been insufficient. If we don’t do something now we can bet that the Sumatran tiger will be extinct within 3 years, and the orangutan in 5 to 10 years. 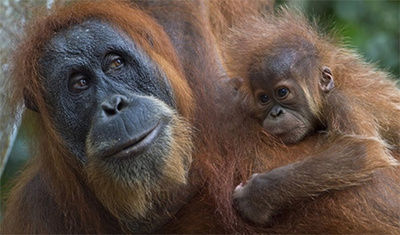 Over 90% in habitat for these animals has already been destroyed in Borneo and Sumatra. Eco systems will support less locals and forced labour will increase. Pollution will increase significantly, with the areas farming considered to be the highest polluted areas in the world. Not only are we condoning the destruction of our forests, animals and climate; we’re endorsing slave labour and child labour every time we purchase a palm oil product. We are endorsing children to contribute to this very destruction because it’s all they can do to survive…there is no livelihood for the local farmer anymore. It can be sustainable, so why aren’t we fighting for it?